Preheat a slow-cooker on high. Place flour into a large snap-lock bag. Season with salt and pepper. Add pork, seal and shake until coated. Heat oil in a large frying pan (or use your metal slow-cooker dish) over medium-high heat. Cook pork in batches until evenly browned. Transfer to a plate. Reduce heat to medium, add onion, garlic and ginger to pan. Cook, stirring often, for 3-4 minutes or until onion softens. Add chilli and curry paste. Cook, stirring, for 1 minute. Transfer mixture to the slow-cooker. Add pork, tomatoes, water, cardamom, cinnamon and curry leaves to slow-cooker. Stir to combine. Cover and cook on high for 3 hours. Stir in coconut cream just before serving. 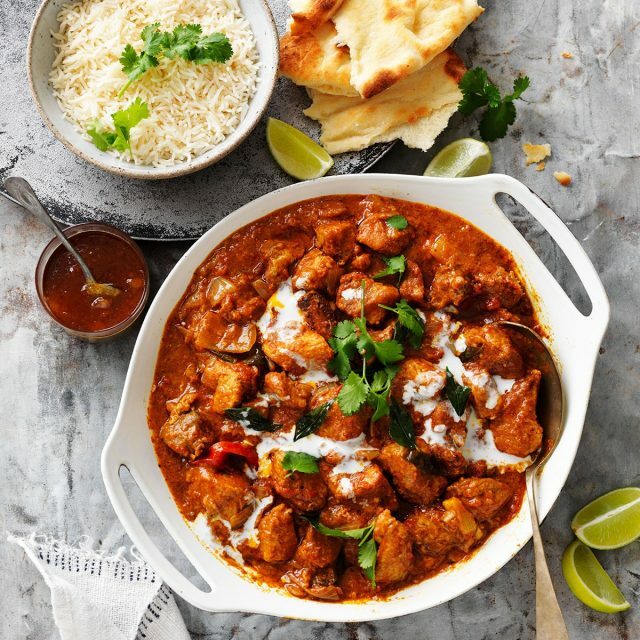 Serve curry with naan, basmati rice, coriander leaves, mango chutney and lime wedges.